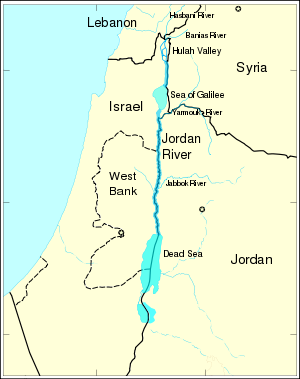 The Jordan River (Arabic: Nahr Al-Urdun; Hebrew: Ha-Yarden River) is a river in Southwest Asia flowing through the Great Rift Valley into the Dead Sea. The Jordan River, with the lowest elevation of any river in the world, rises at the Syrian-Lebanese border where the Hasbani River of Lebanon, and Banias River of Syria meet. From there it flows south through northern Israel into the Sea of Galilee and eventually empties into the Dead Sea. The river is considered the border between the State of Israel and the West Bank. From its source to its Dead Sea destination 124 miles away (200 kilometers), the Jordan actually covers 223 miles (360 kilometers) due to its winding course. As the only major river in the area, it is one of the most significant features of the Palestinian landscape. Historically and religiously, the Jordan River is considered to be one of the world's most sacred rivers. There are countless references to the Jordan in both the Hebrew and Christian Bibles, yet perhaps its most significant is as the location of the baptism of Jesus Christ. The Hasbani River, the longest of the three rises near Hasbayya in Lebanon. The Baniyas River, flowing from Syria. The Dan River, which begins and flows inside Israel. The Hula Valley in northern Israel is the intersection point for the source rivers, which then join and form the Jordan River. The Hula Valley plain was once lake and marshland. In the 1950s, 15,000 acres (6,000 hectares) were drained and transformed into agricultural land. The southern end of the valley has a basaltic barrier which the Jordan has cut a gorge through. 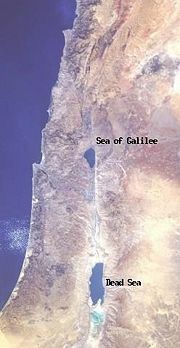 From the Sea of Galilee (the point at which the main tributaries join together), the river's plain spreads to a width of approximately 15 miles (24 kilometers). This area of terraces is known as the Ghawr (or Ghar) and is cut by wadis or rivers into towers, pinnacles and badlands. These form a maze of ravines alternating with sharp crests and rises. From this point, Jordan's floodplain, the Zur sees a widely winding course, which accounts for the excessive length of the river flow in comparison to the area it traverses to reach the Dead Sea. Dams were built along the river in the Zur region, turning the former thickets of reeds, tamarisk, willows, and white poplars into irrigated fields. After flowing through the Zur, the Jordan drains into the Dead Sea through a broad, gently sloping delta. The Hasbani River, which flows from Lebanon. The Baniyas River, which rises from a spring at Banias at the foot of Mount Hermon. The Dan River, whose source is also at the base of Mount Hermon. The Ayoun River, which flows from Lebanon. The Yarmouk River, which begins near the Golan Heights and flows to the Jordan River. The Harod River, which joins on the right bank of the Sea of Galilee. The Yabis River, from the left bank of the Sea of Galilee. The Jordan River is shallow, with its high-water period lasting from January to March, while its low-water period occurs at the end of summer and the beginning of autumn. Its current is swift, carrying a heavy load of silt. It is unnavigable due to its precipitous upper course, its seasonal flow, and its shallow, twisting lower course. The River's high degree of salinity is due to the existence of thermal springs, mainly in the Tiberias region on the western side of the Sea of Galilee. There is also a high concentration of gypsum. Irrigation waters often leave a salt residue in the soil. In modern times the waters are 70 to 90 percent used for human purposes and the flow is much reduced. Because of this and the high evaporation rate of the Dead Sea, the sea is shrinking. All the shallow waters of the southern end of the sea have been drained in modern times and are now salt flats. The waters of the Jordan are an extremely important resource to the dry lands of the area and have been a source of conflict between Lebanon, Syria, Jordan, Israel and the Palestine. The Jordan Valley runs north-south, forming part of the Great Rift Valley which extends four thousand miles from northern Syria to central Mozambique in East Africa. The Jordan Valley itself is long and narrow, averaging only 6 miles (10 kilometers) in width. It is much lower than its surrounding landscape, with steep, sheer, bare walls. The Hula Valley receives approximately 22 inches (550 millimeters) of rainfall per year, but only about 3 inches (75 millimeters) fall north of the Dead Sea. The Jordan Valley is fed by rains falling on the neighboring plateaus, through the wadi system which flow through the valley. In 1964 Israel began operating a dam that diverts water from the Sea of Galilee, a major Jordan River water provider, to the national water carrier. In the same year, Jordan constructed a channel that diverted water from the Yarmouk River, another main tributary of the Jordan River. These acts resulted in great damage to the ecosystem. Syria has also built reservoirs that catch the Yarmouk's waters. It is feared that Yarmouk's flow into the Jordan River could dwindle to a trickle, when a dam built jointly by Syria and Jordan begins operating. In the Hebrew Bible, the Jordan River is referred to as the source of fertility to a large plain ("Kikkar ha-Yarden"), called on account of its luxuriant vegetation "the garden of God" (Genesis 13:10). The Christian Bible mentions the Jordan frequently, about 175 times in the Old Testament and about 15 times in the New Testament, often with scattered and indefinite references. It is noted as the line of demarcation between the "two tribes and the half tribe" settled to the east (Numbers 34) and the "nine tribes and the half tribe of Manasseh" that, led by Joshua, settled to the west (Joshua 13). Opposite Jericho it was called "the Jordan of Jericho" (Numbers 34-35). The Jordan has a number of ford crossings, one of which is famous as the place where many Ephraimites were slain by Jephthah (Judges 12). It seems that these are the same fords mentioned as being near Beth-barah, where Gideon lay in wait for the Midianites (Judges 7). In the plain of the Jordan, between Succoth and Zarthan, is the clay ground where Solomon's brass foundries were located (1 Kings 7). In Biblical history the Jordan appears as the scene of several miracles, the first taking place when the Jordan, near Jericho, was crossed by the Israelites under Joshua (Joshua 15-17). Later the two tribes and the half tribe that settled east of the Jordan built a large altar on its banks as "a witness" between them and the other tribes (Joshua 10, 26). The Jordan was said to be crossed dry-shod by Elijah and Elisha (2 Kings 2). Elisha performed two other miracles at the Jordan: he healed Naaman by having him bathe in its waters, and he made the ax of one of the children of the prophets float, by throwing a piece of wood into the water (2 Kings 5, 6). At the end of their Wilderness Journey, after Joshua succeeded Moses as the leader of the people, the Israelites entered the Promised Land by crossing the Jordan River that, like the Red Sea, was miraculously parted for them (Joshua 3). The New Testament details John the Baptist’s baptism of Jesus in the Jordan (Matthew 3), perhaps its most significant reference within Christian belief. Blank, Wayne. The Jordan River, Church of God Daily Bible Study. Retrieved June 25, 2007. Encyclopædia Britannica. 2007. Jordan River. Encyclopædia Britannica Online. Retrieved June 25, 2007. Glueck, Nelson. 1946. The River Jordan, Being an Illustrated Account of Earth's Most Storied River. Philadelphia, PA: Westminster Press. Grunfeld, Lilach. 1997. Jordan River Dispute. The Inventory of Conflict & Environment. Retrieved June 25, 2007. Hay, Ralph L., and Mike Meriwether. 2004. Jordan River Assessment. Lansing, MI: Michigan Dept. of Natural Resources, Fisheries Division. Stevens, Georgiana G. 1965. Jordan River Partition (Hoover Institution Studies 6). Stanford, CA: Hoover Institution on War, Revolution, and Peace, Stanford University. This page was last modified on 23 May 2014, at 16:30.